Tranquility awaits! Built in 1926, this charming English Cottage is nestled among the quiet hills of Silver Lake and combines gorgeous architectural details with enchanting scenery and beautiful views. Step through the entry gates flanked by lush hedges, and make your way down a winding brick path through a serene garden with abundant greenery. An airy outdoor dining room awaits, complete with an incredible brick patio, stone wall detailing, and a cozy brick fireplace perfect for entertaining. Arts and crafts architectural details complete the 2 bed, 1.75 bath home throughout, and include both peg and groove and refinished pine subflooring, along with shaker cabinetry to set this stunning English Cottage apart. Abundant natural light fills the beautiful open dining space, ideal for entertaining. The dining room features floor to ceiling picture windows and is crowned with a stunning deco chandelier. Through the doors and into the kitchen, you'll find a quaint breakfast nook overlooking an outdoor balcony and views of the hills of Silver Lake beyond. The upstairs is a private, relaxing retreat, engulfed in natural light and complete with a master bedroom, dual sink bath and sitting room overlooking the downtown skyline. The garage currently serves as a spacious studio, set apart from the house by a stone pathway, and tucked amongst the backyard foliage. 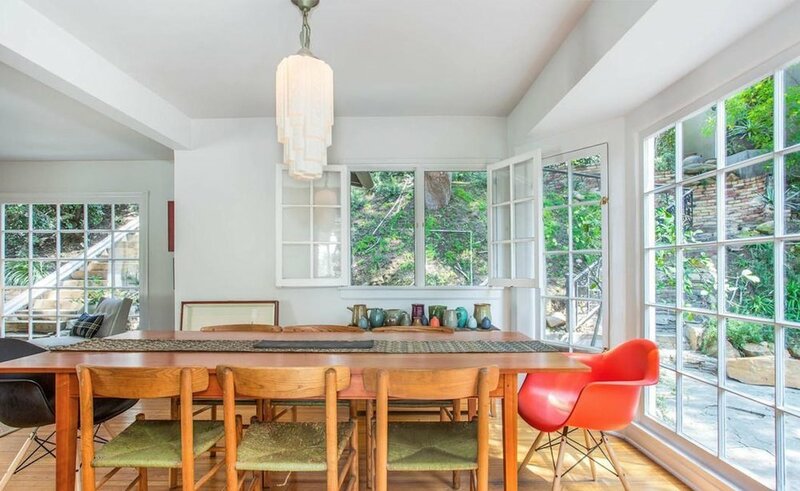 This unique English Cottage sits within the quiet hills of Silver Lake, above the hustle and bustle of the city. You'll be just steps from the lake's running paths, a dog park, and charming restaurants and boutiques. You won't want to miss this English Cottage gem at 3032 Windsor Ave!